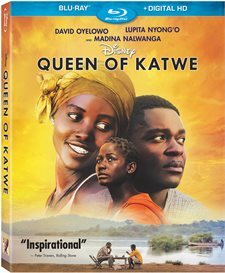 Download Queen of Katwe in Digital HD from the iTunes store. Queen of Katwe images are © Walt Disney Pictures. All Rights Reserved. Sometime between 280 and 550 A.D. in Eastern India, the foundation for the modern game of Chess was born. Evolving and changing throughout the centuries, it essentially became what we know today in approximately 1475. A game of skill and strategy, it uses a board of sixty-four squares and thirty-two pieces (16 per player) and while known throughout the world, it is often associated with a level of high intelligence. Not many of today's youth from the "slums" of any country have seen a chessboard, let alone competed and won on an international stage. However, Phiona Mutesi (Madina Nalwanga) is an exception to this rule. 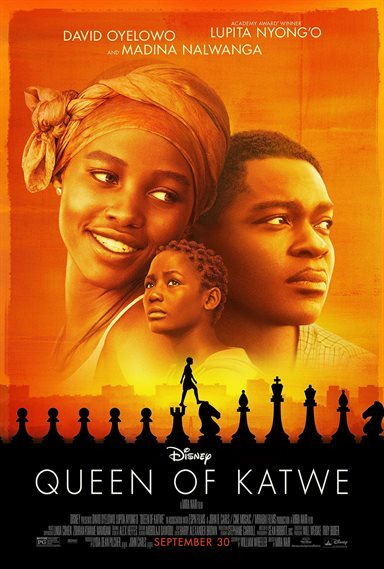 Growing up poor in the town of Katwe, Uganda, she learned the game from a missionary worker by the name of Robert Katende (David Oyelowo; Selma) who has coached her and other children in the town in the art of chess. In 2012, a book was written about her called "The Queen of Katwe" and it was adapted into a major motion picture this past fall. This week, it comes to stores on Blu-ray and Digital download. Phiona was a young, poor, uneducated girl; one of four children living and working for her mother Nakku Harriet (Lupita N'yongo; 12 Years a Slave). Her father had died, leaving them to try and fend for themselves to make a living and find food. One day, Phiona followed some children to the Promise missionary church where they got a cup of porridge and played a board game – chess. Intrigued, Phiona and her brother, Mugabi Brian (Martin Kabanza), joined the group and learned to play. Robert, believing in the kids, scraped together the money for entrance fees for a chess tournament at a rich private school. While many of the children did well, Phiona excelled, anticipating her opponent's chess moves 8 plays in advance. She won the whole tournament, moved on to national and international competitions and today is a Woman Candidate Master on the world chess stage at the young age of 20. She is finishing high school and plans to attend college. Director Mira Nair (Monsoon Wedding) has a unique eye for bringing the joy and relevance from her surroundings and Queen of Katwe is no different. She gives the slums a certain vibrancy that makes them jump off the screen and completely immerses you in this world. Her shots aren't grandiose nor oversimplified but mix the right blend of scenery and content. Oyelowo does a wonderful job of bringing this real-life mentor to the big screen, adopting his speech patterns and mannerisms beautifully and working well with newcomers Nalwanga and Kabanza. Both young talents are gems in the rough who give exacting and methodical performances. Oscar winner N'yongo rounds out this cast as Phiona and Brian's skeptical mother. We see her struggle with the opposing ideas of wanting her children to succeed while not wanting them to get their hopes up only to come crashing down…basically what any mother deals with when it comes to her children. The Blu-ray has a terrific clarity about it, as it is presented in 1080p high definition video with a 2.39:1 aspect ratio. The vibrant colors of the market create a sharp contrast to the dirt and reddish hue of the slums. The DTS-HD Master 5.1 audio is sharp and crisp with a lossless audio track that is clean. The mix is well done with no need for volume adjustment throughout viewing. The Blu-ray comes with a number of extras, including audio commentary with Nair and deleted scenes. There is also a segmented 30-minute look behind the scenes of filming and the cast, crew and Katwe, a feature highlighting Alicia Keys and her theme song, and a short film directed by Nair detailing the life of mentor Robert Katende. The extras give some nice insights and are definitely worth watching. The film takes some time to get going and I found moments of the beginning to be a little confusing. However, the overall feel of the film is one of inspiration, making you want to root for the underdog. Knowing this is based on real life events doesn't diminish the outcome and actually makes one want to keep going to see where Phiona is today (luckily, we have the internet for that). A nice tale by Disney, Queen of Katwe should be required viewing (and reading) for any middle school student.